The long-awaited probe into the president is expected to be publicly released Thursday. Here's everything you need to know. Many of those interviewed included those who've been at the highest levels of the White House, including former chiefs of staff John Kelly and Reince Preibus, and ex-White House counsel Don McGahn. The probe led to 34 people and three companies being criminally charged, including former national security adviser Michael Flynn, Trump's former campaign manager Paul Manafort and the president's longtime personal lawyer Michael Cohen. The Washington Post reported Wednesday that there would be only light redactions, citing anonymous sources "familiar with the matter." 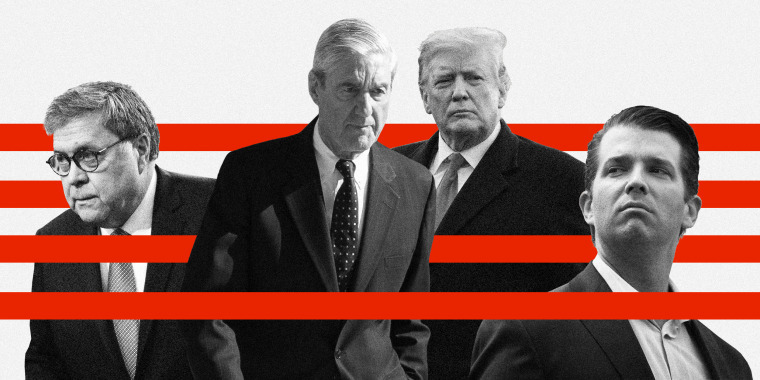 The redacted report will provide very detailed accounts into the obstruction allegations against Trump and offer insight into why Mueller felt he could not come to a conclusion on the issue of obstruction, sources told The Post. On Thursday morning, shortly before the expected release of the report, Trump tweeted, "Presidential harassment!" Barr said he and members of Mueller's team have been working on the redactions together since he received the report on March 22. The attorney general said the redactions will be coded with four colors signaling the four categories of deletions so readers will know why the items were edited out of particular sections, even if they are not privy to the info itself. The Department of Justice says it will submit the redacted report to Congress and the public Thursday morning. NBC News will post a copy of the document on nbcnews.com as soon as it is available. An exact time for the release has not been disclosed, but Barr and Deputy Attorney Rod Rosenstein, who oversaw the investigation, will hold a press conference on Thursday at 9:30 am EST. Mueller will not attend the news conference, according to a spokesperson for the Department of Justice. Members of Congress have been told by the Justice Department they'll get copies of the redacted report on CDs around 11 a.m., congressional sources told NBC News. Sometime after that, the report will be posted on the special counsel's website, a Department of Justice official said. While Barr's summary said that "most" of Trump's actions in the obstruction probe have been publicly reported, that suggests some of them may not have been. An official who spoke with members of Mueller team said they believe the evidence that Trump sought to interfere with the probe was stronger than Barr had suggested in his letter last month. In a court filing Wednesday in the special counsel's criminal case against former Trump adviser Roger Stone, DOJ lawyers told the judge a less-redacted version of the Mueller report would be made "available for review by a limited number of Members of Congress and their staff" at some point. It doesn't specify which redactions would be lifted, although the filing said some of them would have to do with Stone's case. The agency "intends to secure this version of the report in an appropriate setting that will be accessible to a limited number of Members of Congress and their staff," the filing says. Trump's legal team, meanwhile, may issue a "counter-report" on Thursday refuting Mueller's findings, which the president's lawyer Rudy Giuliani told Politico would be "34 or 35" pages in length. "The more concise the better. Four-hundred pages is a novel," he said. Trump, who's repeatedly blasted the probe as a "witch hunt" and a "hoax," said Wednesday he may hold a press conference himself after the report is released. In an interview with "Larry O'Connor Show" on WMAL, Trump said, "You’ll see a lot of very strong things come out tomorrow." He also praised Barr as "a fantastic attorney general. He's grabbed it by the horn."